Search our online inventory - Instantly! As your one stop shop for floor cleaning equipment, ViziClean offers the largest inventory of new and used scrubbers sweepers and scrubber/sweeper combos. We carry all major brands such as Tennant, PowerBoss, Tymco, FactoryCat and more. Supplying a diverse range of equipment allows our sales representatives to fully assist you in the purchase of your new commercial or industrial scrubber or sweeper. 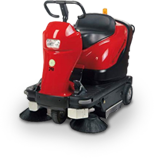 If your office or warehouse only requires a scrubber or sweeper on a temporary basis, we keep a fleet of rental equipment on hand for daily, weekly or monthly use. Instantly browse through our online inventory or rental availability by completing the form above or call a ViziClean representative at 877-327-7260. We also offer parts and service for every make and model. With hundreds of replacement parts ready in stock and on-call repair technicians, we specialize in every facet of the floor cleaning industry. Renting a scrubber, sweeper or combo is easy with ViziClean. Simply fill out the form to view the availability we have for each of the types of equipment in our rental fleet. We will ask you questions such as aisle space dimensions and fuel type to make sure we offer you rates on rental equipment that best fits your needs. If you don’t know your timeframe and need prices to decide which option is best for you, we can e-mail or fax a price quote outlining all rental options. Do you need a rental in another location? No problem! ViziClean has locations in all major cities in the United States and Canada. Copyright © 2012. Floor Sweepers and Scrubbers. All rights reserved.